All over the blogosphere I am seeing Christmas projects galore. Hold up people! Let’s not forget about that little holiday called Thanksgiving that comes in between Halloween and Christmas. I know most everyone has showed off their fall decor and is ready to trade gourds for nativity scenes and berry garlands for fir and feathers. (Feathery garlands, Beth? Oh, yes…just wait. EVERYONE had feathers in their mantel garlands last year. I’m assuming this year won’t be an exception. Expect to see burlap, feathers, nests, numbers, words, etc. ) I’m still enjoying some fading leaves and warmish days so grab your caramel spice latte and kick it with me by the fire. All that you see here was grabbed from various parts of the house and repurposed on my mantel. Yo, I’m a dollar store rooster. What of it? I seriously wouldn’t consider roosters my thing and yet somehow…I have a bunch of them. They work for this time of year. My candlesticks have seen many a coat of spray paint and will probably receive another in the Spring. The barn star was hanging in my kitchen and my knock-off Pottery Barn wreath in the dining room. I just combined the two with some beading wire. The pic below makes me want to rub the rooster to see if a genie pops out and creates a carriage for Cinderella :). Chicka, I can't agree with you more. I don't want to forget about Thanksgiving. Besides, I'm not ready to eat turkey with Mary and Joseph staring at me from the mantel. Didn't the pilgrims have pumpkins? Can I just tell you how I l-o-v-e how you put your wreath over your barn star? Thanks for the idea! I'm going to try that with my star in my living room. Your mantel is adorable! I have to admit, I'm so excited for Christmas already, that I can hardly stand it! YET, I'm still counting my blessings as I look to Thanksgiving. Great post! Nice change from Halloween to Fall/Thanksgiving. Here in Canada we have Thanksgiving in October, so when Halloween is over we get some decorating breathing space before rushing into the next season. I like that return to normal before the Christmas frenzy! I feel the same way! 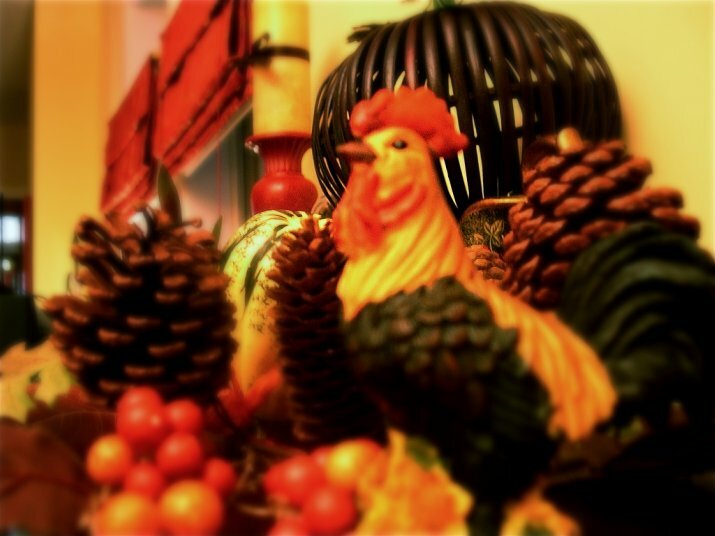 I love Thanksgiving – let's not skip it! Your mantel looks fabulous, of course. So pretty! I love fall decor. Your mantel is perfectly cozy! ~WOW! Beth you truly inspired me with what you did with the star. I'm trying that for sure with mine. It all looks so pretty and Fall-y. PS I'm grabbing your precious button. 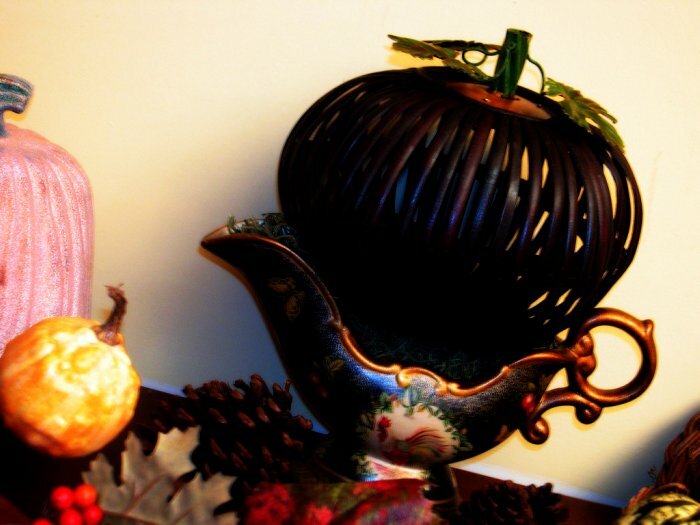 I usually skip Halloween, using a few touches sparingly, and focus on Fall/Thanksgiving for most of this season. It's easy to get sucked into that early Christmas thing though, isn't it? I'm with you…no skipping over Thanksgiving! By the way, just realized that I've been saying "mantle" as in layers of the earth rather than "mantel". Oops. Just for the record everyone, I ADORE Christmas and seriously cast no judgment on you if you are enjoying getting ready for "the most wonderful time of the year" right now. Homemade gifts are the way to go for Christmas and I'm looking forward to Just a Girl's "I Can Make That" party. I'll be posting and joining in. I really just wanted you all to see my fall mantle :). I'm with you–I can't get out the Christmas stuff until the turkey is eaten. Love your mantels! 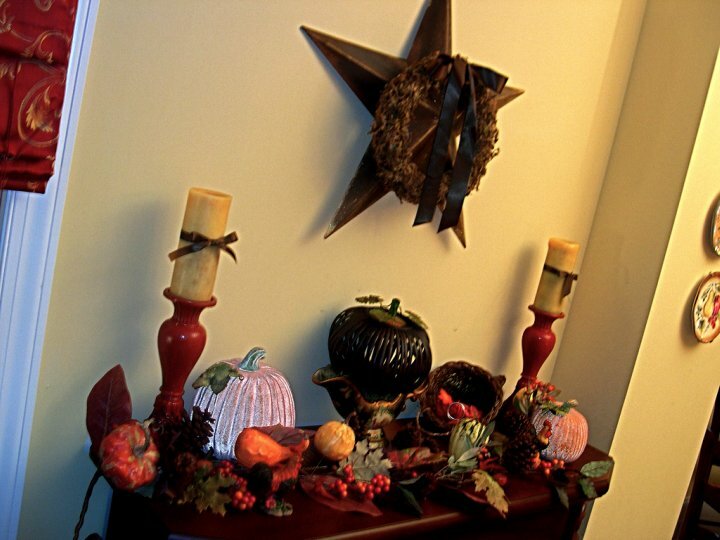 I love your Fall mantel, Beth! I don't seem to have as much decor that says "Fall", but I do have it out. I'm planning ahead for Christmas but haven't put anything out yet. I do like to see the posts though to get ideas since most gifts will be home-made this year. this makes me really miss the fireplace in my old apartment! looks amazing! love it! I love your Thanksgiving decor! I decorate for fall as soon as a chill comes into the air in September. I love the colors and the season! I am so thankful for all God has done for my family and me. I am also thankful for the opportunity I have of reading your blog and seeing the lovely way you craft and decorate your home! Thanks! Great post! It makes me crazy that folks seem to forget about Thanksgiving in the rush to get Christmas "up". Don't get me wrong, I love Christmas decor. I just don't like to rush the season since I keep my stuff up until Epiphany. Thank you for sharing some great photos for FALL! 🙂 I know other bloggers are polishing up their Christmas decor, but I just can't bring myself to do it yet. I feel like this year, I want to give Thanksgiving a real shot (I started a 27 Days of Thankful thing on my blog a few days ago). I am a HUGE sucker for Christmas, Christmas decorations, parties, buying gifts, etc…but I wonder if I started focusing on it all now if it might start to detract from the real "Reason for the Season." Just my humble opinion. 😉 Thanks for sharing! You have definitely inspired me to get a barn star…the ways you've used them are awesome! I'm always looking for one in every store we go to! 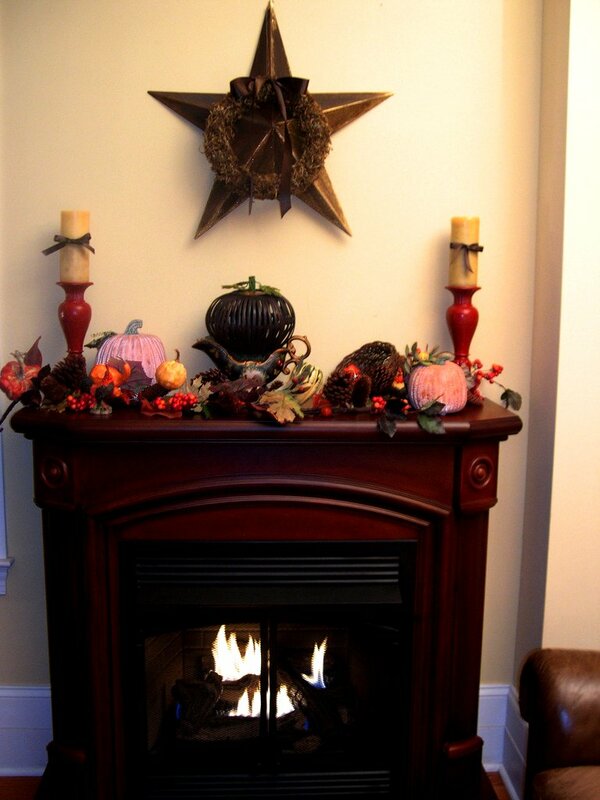 Beth, Your mantel looks great in all its autumn decor! 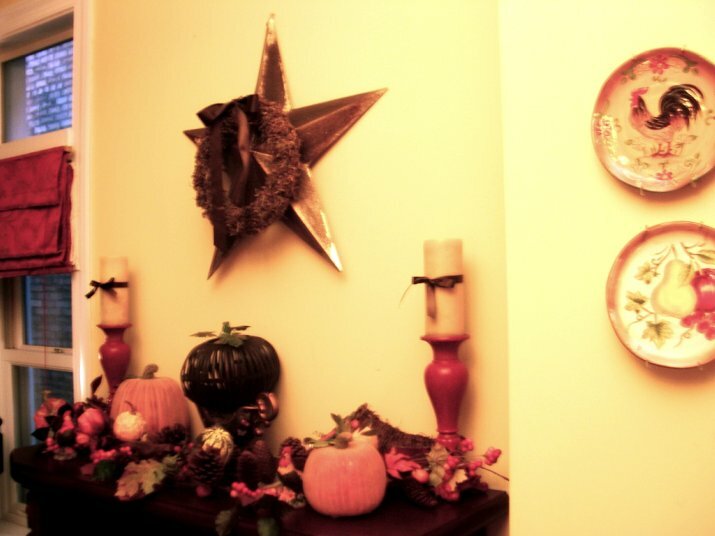 Love how you layered the wreath over the star and placed the pumpkin in the rooster gravy boat. IS it a gravy boat? Clever idea, that one! Pretty! Those roosters are working for you! Your fall mantle looks wonderful! 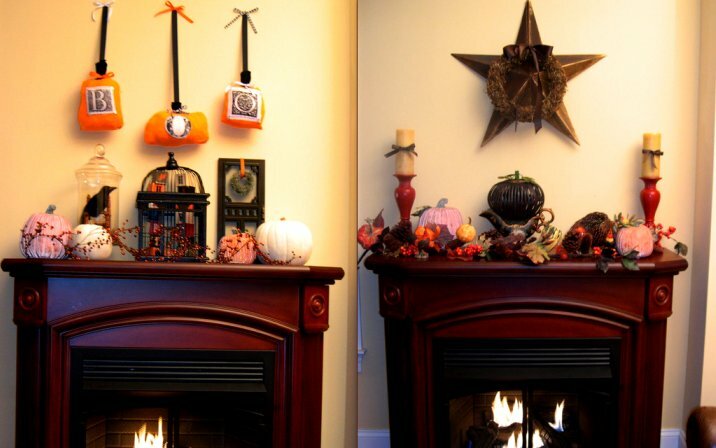 Love your fall mantle. I am one of those people who goes straight from Halloween to Christmas (Put up my tree already). We celebrate Thanksgiving at my Grandma's or I might want to leave fall in the home but I can think of nothing to be more thankful for than the birth of our Savior.